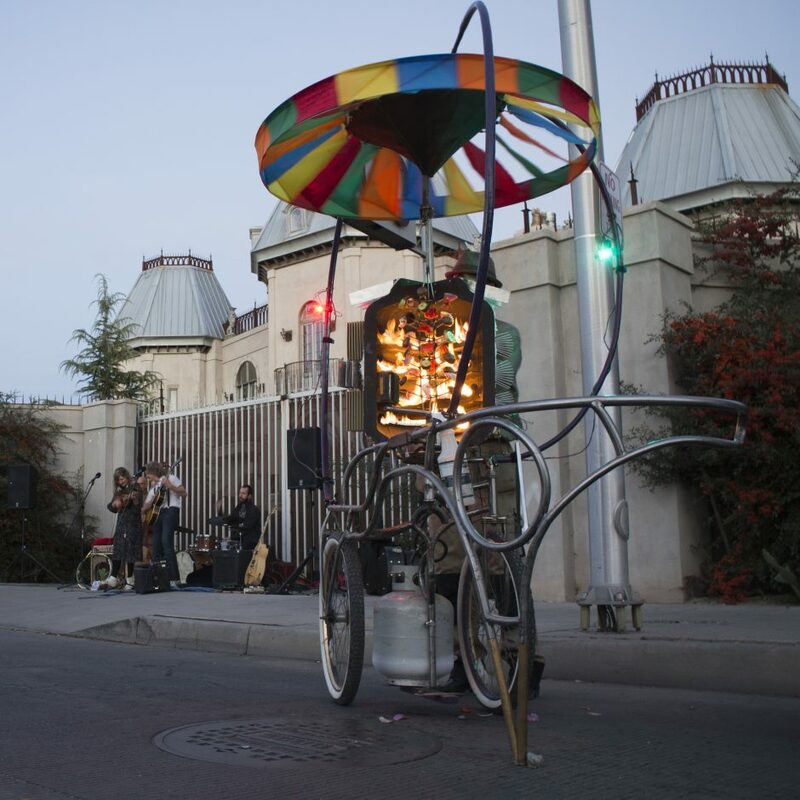 The Rotisserie Rickshaw is a specialized propane grill and sculptural research project. It is the second element of a body of work that will one day form a techno-grotesque traveling farm spectacle called the Edible Carnival. EdibleCarnival.org will host technical documents, making knowledge gained through the creation accessible to anyone with internet access. The Rotisserie Rickshaw harnesses the convection of hot air to turn a turbine that drives the spit, slowly rotating vegetables as they roast. Excess heat is dissipated through an array of Peltier modules (or thermoelectric generators) that provide electrical current to power an series of LEDs that illuminate the work. Throughout the events the Rotisserie Rickshaw roasts vegetables, that are given freely to the audience. The work celebrates technological possibilities as they relate to the requirements of the living thing and the human spirit. Made Possible in part by the Fulcrum Fund, a grant program of 516 ARTS in partnership with The Andy Warhol Foundation for the Visual Arts.